"This is the veggie dip my mom always used to make for me, and now I've taken it over. It's always a big hit at parties. Serve with your favorite raw vegetables." 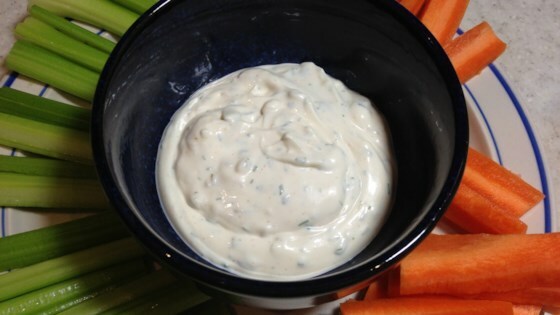 Mix sour cream, mayonnaise, onion, parsley, dill, and seasoned salt in a bowl. Cover and refrigerate until ready to serve. This dip recipe is absolutely delish! The secret is the seasoning salt. So good! I used dried herbs (in smaller amounts) and the dip was fabulous! This dip is amazing! My mom's friend made this exact recipe and it was great with any fresh/raw veggies! Addicting! I will be making it for my next food-related event. Love this dip. I didn't have any seasoning salt, so I substituted half the amount with regular sea salt, and the other half with chili powder. It was a hit! The family loved it. I did add a little more dill, but that was the only change. This makes surprising more than I thought.